Lupus, the Wolf, loops around the picture to the southwest of Scorpius. 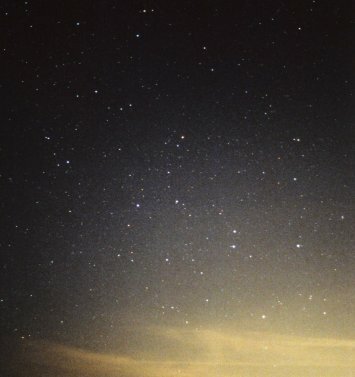 Kakkab (Alpha Lupi) is the brightest of the stars near the lower right corner (and within the horizon clouds). Beta Lupi is the lower of the two stars up and to the left (the upper is Kappa Centauri). Delta Lup lies at the center, while Gamma is to the left of Delta and GG the first star down and to the right of Delta. The brightest star near the upper left corner is Rho Scorpii (which lies south of Scorpius's three-star head). Chi Lupi is at the top of the loop down and slightly to the right of Rho Sco, while Theta Lup is down and to the right of Chi. Zeta Lupi lies at bottom center with Kappa just above it, while Iota Lup is to the right of Kakkab. The two brightest star within the lower part of the loop up and to the left of Kakkab are Lambda (top) and Pi. Norma is at the lower left corner, while Centaurus sprawls to the right The stars of southern Libra are at the top. Tau Lib is the lower of the trio just left of the top center edge. See Lupus from Bode's Uranographia of 1801.